I was burning disks (CD, DVD and DVD Dual Layer) without any issues. I bought the Blue-Ray plug-in and that worked too. Then there was a critical patch that got install in the last couple of weeks. Now I get error burning, I went to software rendering and I don't get any errors burning, but nothing other than single layer DVD seems to work so far in my Sony Blue-Ray players. So far everything I do doesn't work anywhere if it gets an error, but if there is no error it doesn't work in the TV players, but does work with WinDVD. Anyone else had similar experiences? Its starting to get expensive trying different things with the Dual layer disks and I don't even want to start experimenting with the BD disks. Then there was a critical patch that got install in the last couple of weeks. Critical patch for what your Windows Operating System? Sorry I was more specific. It was a Roxio patch/update. If you think it's the Roxio patch which has caused this, it is possible to back out of the patch. -You run your main Creator NXT 5 installer, setup.exe. -chose to Repair rather than Install, and you'll be returned to your original pre-patch condition. I tried the repair function. Things got a lot worse. So I tried completely uninstalling everything and reinstalling. The burning is now working, but the installer/uninstaller scripts don't work well. The painstshop software uninstall failed and not the installer thinks its still there, also MyDVD will not not open existing projects without failing, each time I must now create the project from scratch, attached the videos and then burn or save as an ISO file. Is there an uninstall cleanup tool for Creator NXT 5 Pro? Many of us use the free version of REVO Uninstaller. 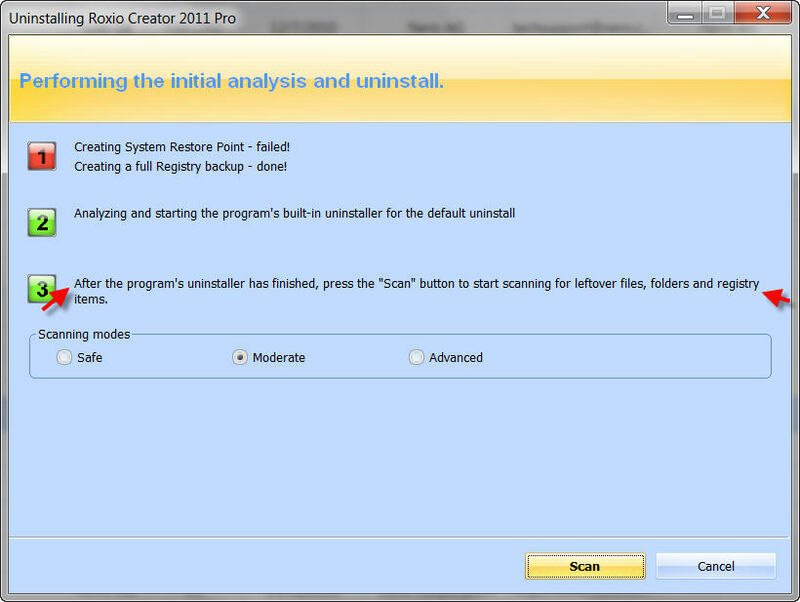 There is also a trial version of REVO uninstaller PRO. USE ONLY THE MODERATE MODE!!!! PRO will also uninstall programs that are only partially installed or uninstalled. USE at your own risk. Remember to reinstall to a Windows administrator's account. Turn off your antivirus until you reboot after the reinstall. Downloaded and installed the trial version of REVO uninstaller pro. Uninstalled everything, The actual Creator NXT Pro 5 last. Rebooted. Started the Roxio installer, it still thought one of the additional content items was already installed. Only options applied were to put it on my D disk (C is a 256 GB solid state drive) and complete. Everything installed with no errors that I saw including PaintShop pro. Rebooted. Checked for updates, applied updates. Applied BlueRay plug in. Tested MyDVD opening existing project, program terminates you click on the MyDVD project file or try to open it as an existing project once the program has started. I can still create a new project. Only options applied were to put it on my D disk (C is a 256 GB solid state drive) and complete. or any left over files still in the registry ? Isn't it a all in one operation? True story cd but if after the scan if you don't "delete" all of the left over files that were scanned you haven't finished the task. Deleteing all of the left over dangling files is a separate operation---at least with the Revo ver I have. Installing the program on D drive may have lost the default file location when you had it installed on C drive, why you cant "loading a previously saved project in MyDVD" . Installing the program on D drive, it still installs over 300 & some mb on C drive, go look. I never loaded it onto C, that's a solid state drive with limited space (256GB, currently a little over half in use). Whenever possible I install programs to D unless they are system related. I played a little more with it a little more this morning. I was able to open new saved projects, but not previously saved projects. I may have to recreate the old MyDVD projects and try again. Any idea if Roxio will ever make the more detailed MyDVD available that they used to have? It allowed you to do so much more than the current version. I told you to go look on C Drive and you will see what I'm trying to tell you! For your corrupted projects, use Windows Explorer to locate one. There will be 2 files, a name.DMSM and a name.DAT file.